Yes, hi, hello! 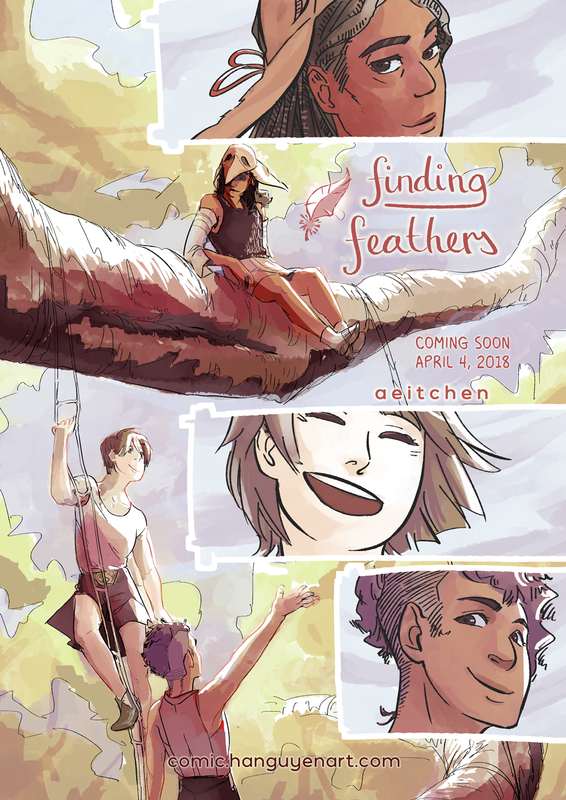 Welcome to the Finding Feathers webcomic site. It will be my first attempt at both a webcomic, and a long-form comic. My longest work up to now was… 16 pages? So we’ll see how far I get with this thing haha. – Serialisation will start on Wednesday, April 4, 2018. It will update once a week on Wednesday. – I’m not putting up pages right away because… I need to make them lol. And I want an update buffer for my anxiety-ridden self. – Colouring is my arch-nemesis. But screen-toning is satan, so really I can’t win. Forgive me. – This will be a fantasy/adventure/slice-of-life comic. Probably nothing too dark? And maybe some frank conversation about mature topics? Yeah. – There will possibly be a lot of airy dream sequences and bad poetry. – Main character is ESL. – I want to livestream pages as I make them (but I need to set it up lol). But if you’re interested follow me on Twitch! Three people are up in a very big tree. One guy with long hair in a hat shaped like a bird’s head looks down at the others. A woman with short hair stands on a rope ladder, smiling up at him. Below her is an NB woman with side-cropped hair, who raises their hand in greeting at him. There are two close-up panels of the woman and NB woman smiling.